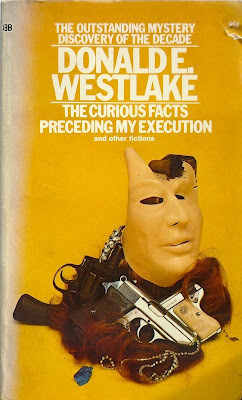 It's a 1973 first paperback printing of The Curious Facts Preceding My Execution (and Other Fictions), Westlake's debut anthology, published in the US by Ballantine in 1973, with a cover photo by Roger Phillips. 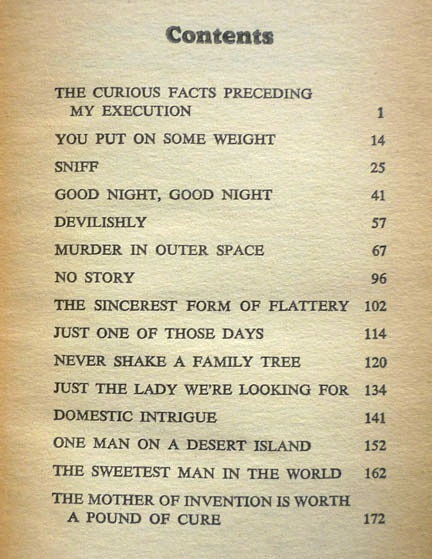 First published in hardback by Random House in 1968, the bulk of the stories herein originally appeared in Ellery Queen's Mystery Magazine and Alfred Hitchcock's Mystery Magazine in the 1960s – the first full decade of Westlake's professional writing carer – including the title story, a tale of a spousal murder that takes a turn for the farcical when, having successfully accomplished the deed, the exasperated husband narrator is beset by a seemingly endless procession of cold callers and door-to-door salesman. Indeed, given that "The Curious Facts Preceding My Execution" (as in, the short) was actually written under Westlake's Richard Stark alias, it's interesting that it's closer in tone to a more comedic Dortmunder outing than a poker-faced Parker joint. A shade or two darker, perhaps, but then many of the stories in this collection straddle the divide between Westlake's hardboiled work and his capers. "You Put on Some Weight", for example, has the feel, tonally, if not of a Parker, then of a Killing Time or 361. Structurally, though, it follows the same template as the Dortmunders or the standalone capers, as an ex-con protagonist is continually frustrated in his efforts to get back to the criminal life he enjoyed before incarceration. Haven't got around to this one or Levine yet. I do have Thieves' Dozen, and found it enjoyable. I'm not a big fan of short stories in general--they're just something unsatisfying about them, like having a nibble of a sandwich instead of the whole damn thing, but make an exception if I really like the author's full-length work and especially if said author's shorts stories feature a character I like, as in Dortmunder's case. I have this very edition, and read it with some interest. Westlake seems to have known quite well that the short story was not a form he was destined to master, but he does often seem to have used short stories as preliminary sketches for ideas he would then develop much more successfully in novel form. 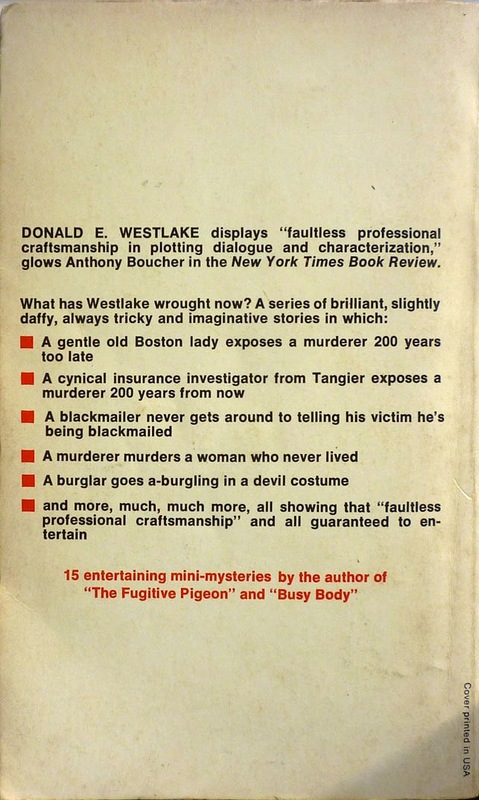 I also noticed that he was writing humorous stories much earlier than we are led to believe by some overviews of his career--indeed, his earliest short stories in this vein predate any of his serious crime novels, written as Westlake or Stark. This contradicts the notion that he started out as this very dark bloody storyteller, and then transitioned into a teller of whimsical stories of fumbled heists, and mistaken identities. I always seem to detect elements of humor in everything he writes--even in something as brutal and searing as "The Ax". People are funny, and he can't stop seeing that. What took time for him to develop was the ability to really sustain a gag, build on it, milk it to maximum effect, and he didn't manage to do that until "The Hot Rock", though many of his earlier comic novels are more than worthwhile. As I've said here before, dying is easy, comedy is hard. I must admit, I struggle with the short story form as well – exceptions being Ray Bradbury, and Michael Gilbert's Calder & Behrens stories. I've enjoyed some of the Westlake shorts I've read – and I've not read all of them, by any means – but nothing's really blown me away. I did have a line in the draft of this post about Westlake not being a master of the form, but took it out, as I haven't read enough of them to say that for certain. I'd like to get a few more under my belt before attempting as sweeping a statement as that. If you want to read the short story at its supreme level of expression, Frank O'Connor is your only man, Nick. 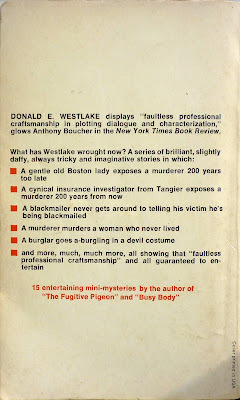 He didn't write crime fiction, but I detect some of the same attitude towards people as I find in Westlake's best stuff--compassionate yet biting, amused yet despairing, and yet in spite of all evidence to the contrary, perversely hopeful. Should try 'A Good Man is Hard to Find' by Flannery O'Connor as well. Fits very loosely under crime as well - the Misfit is straight from hell. If you like Ray Bradbury, you should try the master of Sci-Fi short stories-Theodore Sturgeon. You should also try Robert Bloch (horror-suspsense), and Charles Beaumont (horror-fantastic fiction). Those writers will give you an appreciation for the short form. I'm surprised that collection doesn't include Westlake's "Anatomy of an Anatomy"; I read it in an Alfred Hitchcock collection back in 1964, so it came from early in his career, too. 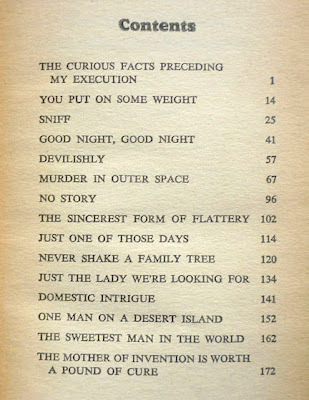 I think quite a bit of his short fiction was never collected. He was never much associated with short stories. Most of the existing collections have some theme--his science fiction, or his Levine stories. He was by no means inept at writing short fiction. It's just that whatever it was that made him special didn't tend to come out as well in that form. With Westlake, the devil is in the details, and there was more room for those in a novel.